Many ladies who are dark have really searched for many ways to make up, just for them to look attractive and even more charming than they are with their natural beauty but they have not seen. Though most of them have tried their best While some have applied the ones they know or the ones they were thought and they think its the best. In life, no one is perfect and no will ever say that she knows all. Even our teachers were taught by some people, and they're still learning. So, that is why we want to teach you as well, so as for to be able to teach others too. Always remember that no knowledge is a waste. When you gain knowledge, whether physically, mentally or online, you are expected to share it, don't let it die with you. It all feels like a dream to me today, because I never knew I will be so perfect with makeup, It feels like it happened yesterday though it was 8years ago, when I started as a beginner learning how to make up, even making some mistakes on my face as well, some of them makes me feel and look even uglier. The reason is that I don't know color combinations on make-ups, but as it stands now, I'm a professional in makeups no matter your skin color. The truth is, I'ms till surprised at my self because i never knew that I will one day be a great makeup artist. 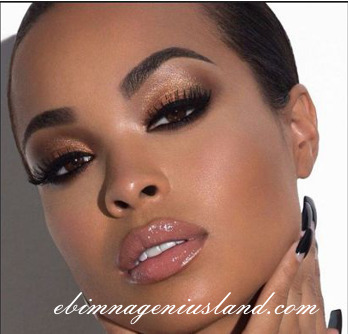 Now, its time for us to tell you that here's a quick look at the tools, makeup tips for Black women and techniques for creating a gorgeous look starting with the makeup basics. Just follow the steps, it's really gonna be awesome trust me! The Application of good foundation feels like second skin and never looks like a mask. Once you choose the right kind of foundation for your needs, the proper application makes all the difference too. Always remember that while applying the foundation, don't apply it so much, so that when you sweat you will not look like a Christmas masquerade. So many dark ladies will feel their faces with all the foundation they bought that day, all in their faces, and once they have a single sweat in their faces, it will expose all the foundations, which is really not advisable. take note of applying a smaller quantity just on your skin. It's very simple if you are determined, Learn how to choose and apply your foundation so no one can tell it's there. You'll be getting compliments on your "flawless skin" in no time. Try it Out! Some will say, it's of no use for me to apply powder, while some will even say that they have passed the level of applying powder. Well, I must cheap it in for your own benefits because it's very crucial to apply powder if you have an oily face like mine. Bear in mind that makeup powder should be your best friend when it comes to creating lasting makeup looks on oily skin. Don't feel bad, I'm only here to guide you, It's just a guideline, my face is as well oily like yours, so be glad you have a partner rather than feeling bad. I love you!!!. Follow this method to apply your eyeliner. Apply your eyeliner from the outer corner of the eye towards the middle, make sure you do it gently in order to avoid mistakes. Don't be in a hurry whenever it comes to the eye. Repeat the same action starting from the inner corner of the eye and connect that line to the other in the middle. Make sure you did not exceed the line limits. Your eye is one of s..xiest part of your skin that attracts a dude to you, so don't mess it up. Always Use short strokes to work the liner into the base of the lashes, rather than drawing a line on top of them. Make the line thicker or thinner according to how bold you'd like it to be. The choice is yours to make. Use a cotton bud to smudge the line for a softer look, or dip a slanted brush into a similar shade eyeshadow as the liner and trace over it to soften the line even more. This also helps to set the liner so it will last longer. Remeber to Fix any mistakes like lines drawn too far or done too thick with a clean cotton bud or a sponge with a little foundation on it so that you will look so wonderful. It's not a must you will fix eyelashes but because you don't have lashes in your natural eyelash, you can fix it to enable the activation of your eyeliner. Fixing eyelash is very risky especially when the person fixing it is a learner, or the makeup artist's hand is checking in the process. Sometimes during the process, when the person fixing the eyelash have tears in her eyes, it's really not encouraged to continue. You are expected to stop until the teras in your eyes dry. Eyelashes make our face looks more pretty but make sure you don't risk it. Always go to professionals to help you fix it, or if you can fix it by yourself, that is even the best idea. Your wet lip gloss is your beauty, it brings you a nice look to your lips. When you have a black lip like mine which is so natural, there is no need of giving your lips an odd color of wet lips that will make you look like a man-made human. You just have to pick up a pinch color of wet lips and apply only on your lower lip, then on your upper lips, you can apply a watercolor of wet lips, which in return gives you back the color of your natural lips. You will look so natural with makeup and as well so be attracted to look at. Guess what? You are looking so pretty! Your eyebrows are two of the most important parts of your entire finished makeup look, when you give it a nice shape, you will be on top with or without makeup. The right brow shape frames your face, bring out your features and makes you look polished even if you don't do anything else. Try it out and see, When you give your eyebrow the best shape ever seen and they both are been familiar with each other, you will be the talk of the day. Check it out!